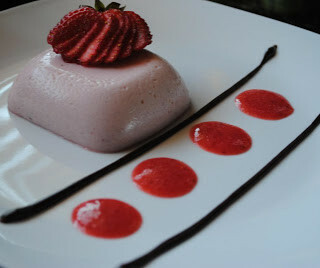 These were a last minute dessert made for Mother’s Day last night. We have a big family dinner every Sunday, with my parents, grandparents, and whatever siblings we can round up. We’ve done this every single week for as long as I can remember…since I was at least 5 years old. My Dad has cooked Sunday dinner almost every single time. Years ago dinners usually consisted of a roast, mashed potatoes and gravy, you know. The more traditional family meal fare. Nowadays, things have lightened up a bit. We usually have salmon, fresh roasted veggies, risotto or couscous, and berries. And I have to tell you, I love salmon and my Dad’s salmon is the very best I’ve ever had. So much better than any restaurants. He coats in olive oil, salt and pepper and rosemary, and then grills it in a pan so that the skin gets incredibly crispy. But anyway, back to the berries. About 1/2 hour before dinner was ready last night, I realized that the only way there was going to be dessert(and I need my dessert) was if I threw something together myself. My Dad’s bowl of fresh berries on the dinner table caught my eye. So I stole a few and whipped up these fresh little cupcakes. 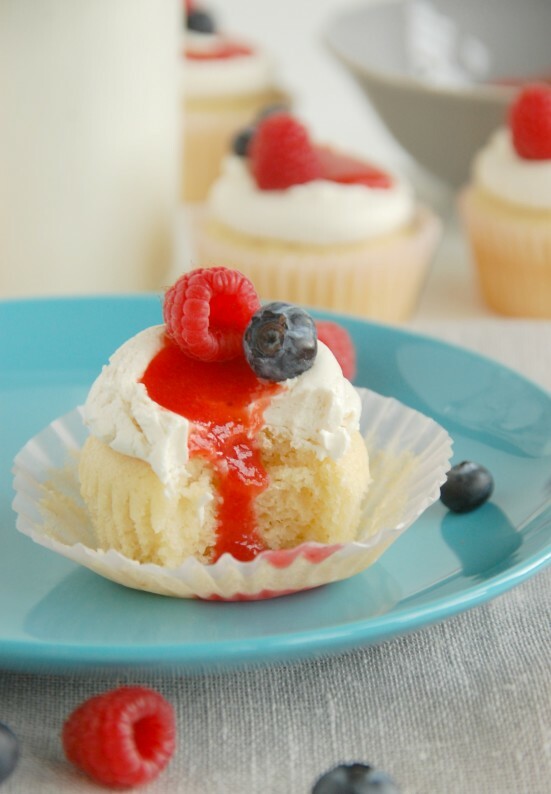 These cupcakes are not a full-on strawberry cupcake. 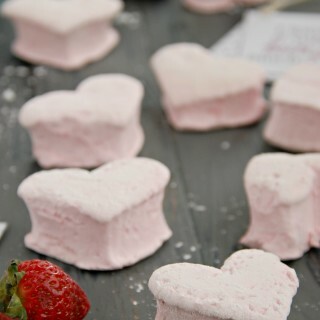 Just strawberry scented, so they are mostly a yellow cake with a hint of strawberry flavor. I took my usual white cake cupcake recipe and added the yolks back in for a yellow cake, and then switched out the sour cream for Greek Strawberry Yogurt. Do use the Greek yogurt, if you can. 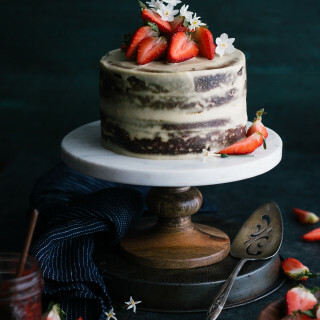 It leaves the cake the most moist. If you just happen to have regular on hand, that will still work just fine. 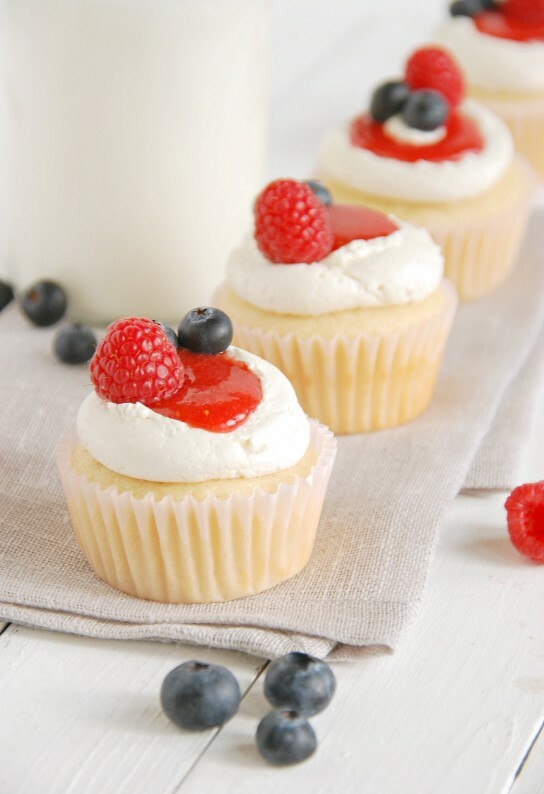 The cupcakes are topped with a light, not too sweet Swiss Meringue Buttercream which is filled with a pool of fresh strawberry puree. 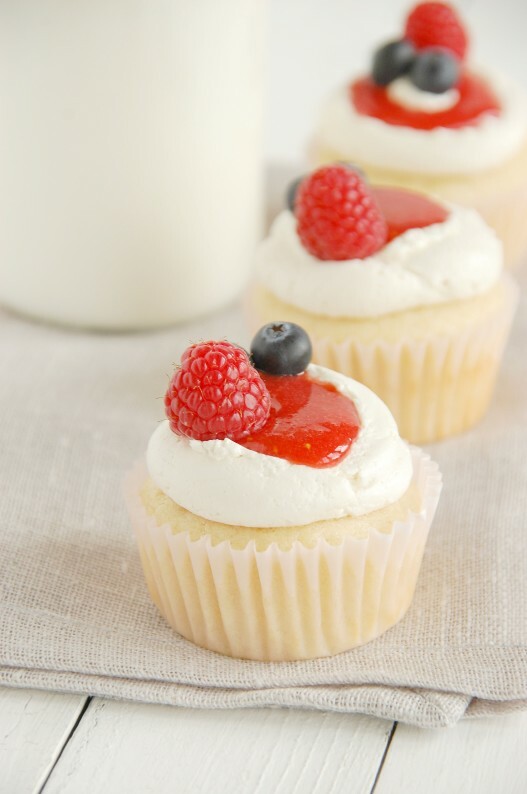 Add a few fresh berries to the top and you are in a berry wonderland. Sorry about the dark-ish pictures, I shot these at about 7 last night. What can I say? I have a hard time NOT photographing anything that has berries on it. *Cook cupcakes until just barely set. Do not allow to brown on top. Place 18 paper liners in wells of a muffin tin. In another bowl, beat the butter and granulated sugar on medium-high speed until fluffy; beat in Greek yogurt until smooth. Add in eggs, one at a time, mixing until smooth(scrape down the bowl, if necessary). Mix together the milk and vanilla in a small bowl. When cupcakes have cooled, frost them with a spoonful of Swiss meringue buttercream, making a well in the center of the buttercream. 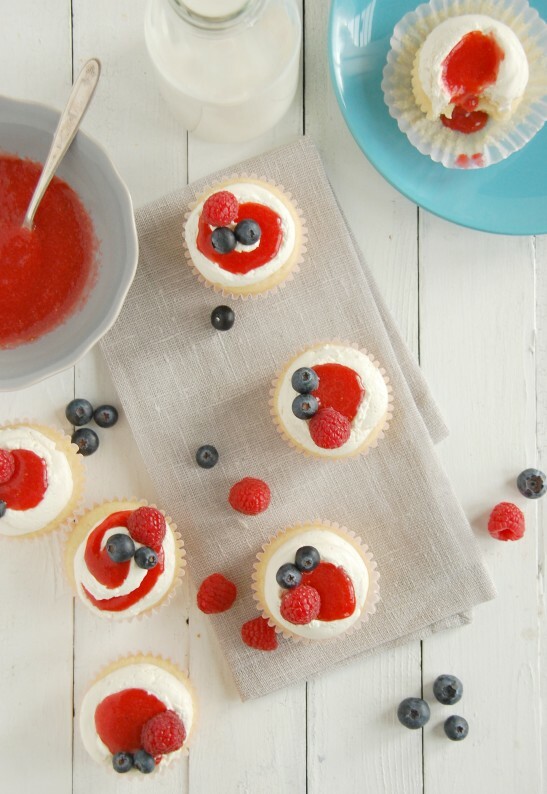 Fill the center well of each frosted cupcake with about ½ tablespoon of strawberry puree. 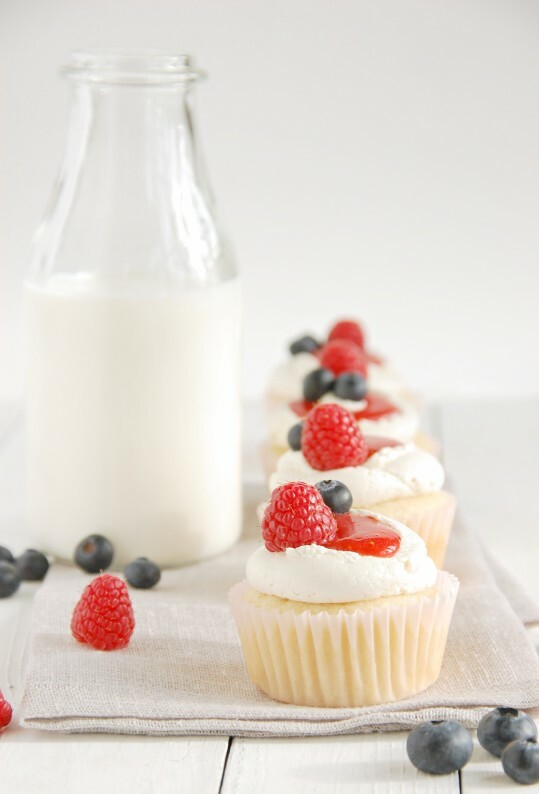 Top each cupcake with a few fresh berries.